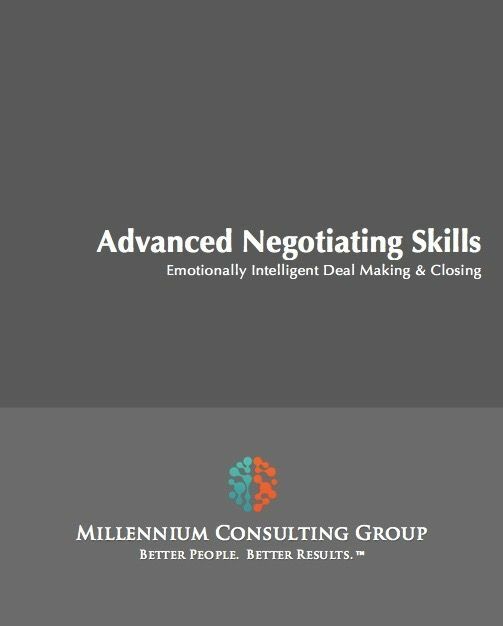 Course Objective - Help participants develop a win-win (non confrontational) approach to dealmaking, asking for the business, objection resolution and closing. Prepare participants to negotiate effectively with a multitude of personality types. Negotiating is becoming more and more difficult for the typical financial professional. Today's financial client has access to a greater number of competitive options and far more information than ever before. And that means more leverage, dealmaking ammunition and negotiating appetite for the prospective client. Furthermore, as internal corporate culture evolves away from the command and control model of the past and toward the collaborate and communicate culture of the future, conducting win-win internal negotiations becomes less of a success skill and more of a survival skill. Respectful and fair negotiation is one of the key drivers of positive relationship growth. Working with others to get them to yes, and to secure a mutually beneficial agreement, is, however, one of the tougher skills to develop. Unfortunately, many consider a negotiation to be a fight that they win or lose. The best know that the goal is to bring about a "win-win" outcome for everybody. "I come in peace but I'll fight if I have to"
"Give me reasons to say yes"
All Millennium courses are tailored for delivery to match the strategy, client demographic, product mix and skill development needs of each client. All Millennium courses are available for delivery via instructor-led classroom session, webinar and/or train-the-trainer sessions.